As a Youth Services staff member, I have been whittling down the list of must-reads recommended by both book review periodicals and fellow Juvenile and YA readers. I have been mired in teen angst, hurled through recycled adventures, and generally worn-out by stories that just don’t wow. 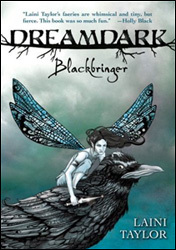 This book, Dreamdark, was recommended to me by a staff member. It sounded like another rehashing of fairy-tale ingredients, but because it had earned such praise, I forged ahead. A world was crafted through the unlikely perspective of a clan of crows and their adopted faery, named Magpie. Never have I read a book so freshly inspired, with language so beautifully wrought, including the author’s own cleverly invented words. Her use of a story’s flow kept me reading, not able to put it down. Taylor’s vision of her world is whole and three-dimensional, with colors and textures easily imagined. The story is unexpected, dark, thrilling. Characters are fully realized, believable, relatable, and amusing, including odd little creatures that endear or repulse, and some truly frightening antagonists. I would never limit this to a juvenile read. Any book lover who enjoys a gorgeously articulated story will savor this one. This book can be described in one word – delicious. This entry was posted in Recommendations, Uncategorized, Youth Services and tagged blackbringer, books, dreamdark, recommendations, youth services by ccld. Bookmark the permalink.